Dr. Brinda Lakshminarasimha has obtained her MBBS from All India Institute of Medical Sciences, New Delhi. She then completed MRCOG from Royal College of Obstetrician and Gynaecologist, United Kingdom. She also completed her FRCOG from prestigious Royal College of Obstetrician and Gynaecologist, United Kingdom. Dr. Brinda has many years of experience from UK and UAE as she has worked with many leading government and private hospitals. She has worked at Corniche Hospital, Abu Dhabi for more than 6 years before joining Women’s Health Institute, Al Ain Hospital as a consultant in the Department of Obstetrics and Gynaecology. She is associated with NMC Specialty Hospital, Al Ain as a full time consultant in the Department of Obstetrics and Gynaecology since 2012. Dr. Brinda has excellent communication and counseling skills. She has dealt with very difficult obstetric cases including technically difficult cesarean sections. She was a part of many interview panels to select specialist for MOH/HAAD, also she trained many graduates for Post Graduate programs in England, Al Corniche Hospital & Al Ain Hospital. In addition, she has attended several conferences and CMEs both intra and inter departmental. 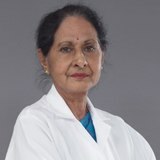 Dr. Brinda is fluent in English, Hindi, Kannada, Tamil and Telugu and can converse in Arabic, Malayalam and Punjabi.